SF Taxi Media: SF Passenger Raves About A Taxi Ride! Read Why! This is a comment posted in the "Ask A Cab Driver" section of this website dated July 10, 2011. Read the person's comment and you may conclude that whoever the driver was that this person raves about, it seems most likely that the taxi is owned by a driver, not a company. Just goes to show how creative owner operators can be when they enjoy their jobs and want to make it fun. It is also an example of the kinds of better, more enjoyable service quality that becomes possible when drivers own their own cabs and take pride in it. This person's comments are not necessarily related to single operator/single shift taxis, but single shift taxis promotes driver owned taxis. Creative people who own their own businesses could mean vastly better service overall. 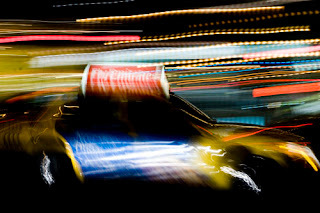 Each night after work I take a taxi home. The other evening I had the best ride home from the coolest driver with the most tricked out mini SUV Yellow Cab taxi I have ever been in. When I went to enter the cab I noticed the windows were slightly tinted and there were flashing lights popping from behind them. I thought "Should I get in?" Woah! Am I glad I did. There were neon lights and flashing bulbs neatly strung on the interior roof, really cool music, "Love Forever" dove decals on the windows, a small disco ball in a cup holder and little black skulls on the dashboard. What a "fine ride!" But it got even better when we made it to 3rd and Market and he put the hydraulic's on and the taxi started bucking and lurching! I loved it. Driving up Kearney Street I could not resist lowering the windows and as pedestrians looked in awe they gave their thumbs up to the taxi. Has anyone else out there been in this "hoppin" Yellow Cab taxi? Yellow Cab says they have over 500 cabs in The City and do not know who it might be. Is there anyway you can find out who the driver is, divulge his cell phone if he permits or get his medallion number so I can call and request him again? Again, it was the best ride home ever and I would love to obtain his services many more times in the future. I'm sure I know who this guy is. I would rather doubt if the average cab passenger would think this was the way to go. How pray tell, does a cab like this make for "vastly better service?" Yes, and it would be better if the driver of this cab doesn't get noticed by MTA martinets. Why spoil this fellow's game ? Also, his countrymen are not all amused, thinking him silly and foolish. But you can certain his passenger was a young male, easily amused. John, I agree with the two anonymous comments above, though many people, mainly children, rave about Disco Cab. I'm surprised by your connecting this with a case for owner-operated cabs. Presuming all cabs were owner-operated, they would have to drive them 24/7. That being unfeasible, they'd have to employee other drivers, which becomes a different situation altogether. One could say the same about business in general. Some business owners are conscientious, imaginative and even generous with their employees. Many others are lying, selfish cheats. Still others are so burdened by the debt accrued by ownership that they evolve from the former to the latter. And many others don't have the means to even get in the game. Promoting medallion ownership and leases is killing the availability of taxi JOBS, which I'd call bad. I am connecting with another kind of owner operator cab... not what you're talking about. My lengthy comment disappeared after after I punched the "Post Comment" button. this is an unfortunate flaw that occurs sometimes with the software that I don't know how to fix. It seems to happen to lengthy comments more so than shorter ones. Sometimes, the software thinks that longer comments could be spam, and automatically puts it into the spam box where it could be later retrieved. I just checked the spam box but there's nothing there. Some other readers have complained in the past that this has happened to them. They punched "post comment", and then their comment disappeared. At this point, I don't know how to handle this aspect of the software. What I often do with blog posts, is I type in in Word Document first and then copy and paste it into the website as a blog post. That way, if anything goes wrong, I have a copy.